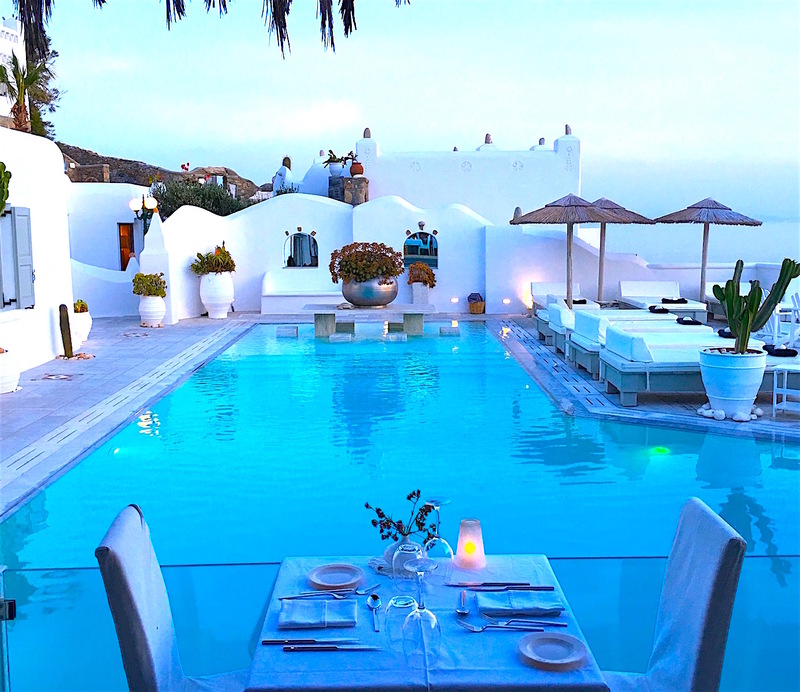 Mykonos has become the ultimate Greek island destination. It is an intoxicating mix of natural beauty, traditional charm and exclusive sophistication whilst, for those who wish to seek it out, there is well-earned party reputation. No other island attracts as many supermodels, rock stars, and not-so-incognito celebrities; in peak season the mega-yachts arrive in force. Mykonos’s celebrity status harks back to the swinging ’60s, when a certain Greek shipping magnate, Aristotle Onassis, rocked up on his yacht with Jackie Kennedy, while the likes of Sophia Loren and Brigitte Bardot or more recently Michael Douglas, Valentino and Tom Hanks are amongst the international jet set to grace its shores. In the main town of Chora, you can forget tacky souvenir shops. Sunseekers drop in to the Louis Vuitton boutique or exclusive jewellery stores. We popped in to Dio Horia the new art gallery, and only just missed bumping in to Jeff Koons before dining at Nammos (see our review here) where a bottle of champagne can cost a super-cool €140,000. If all this sounds rather intimidating, then do not despair – there is plenty for everyone here and within the picture-postcard pedestrian alleyways sit still plenty of excellent and good value shops and traditional restaurants where you can dine on vine-clad terraces and watch the world go by. 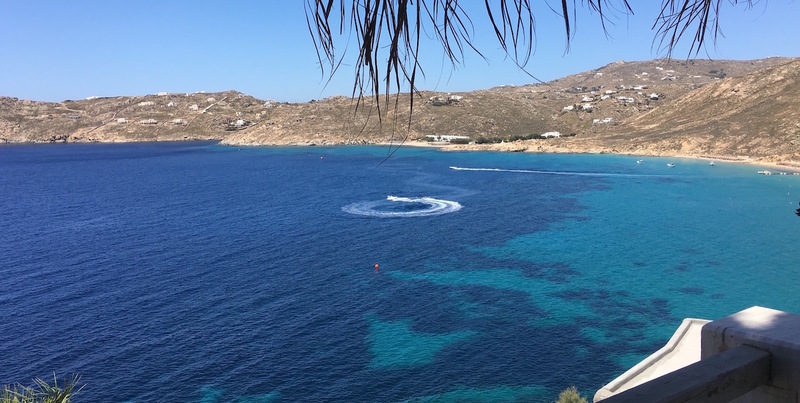 Our view is that the island is best enjoyed by staying at one of the quiet beaches that are easily found a few miles out of Chora. A definite favourite is the long and sandy Elia beach that looks out over a wide bay with rocky headlands. 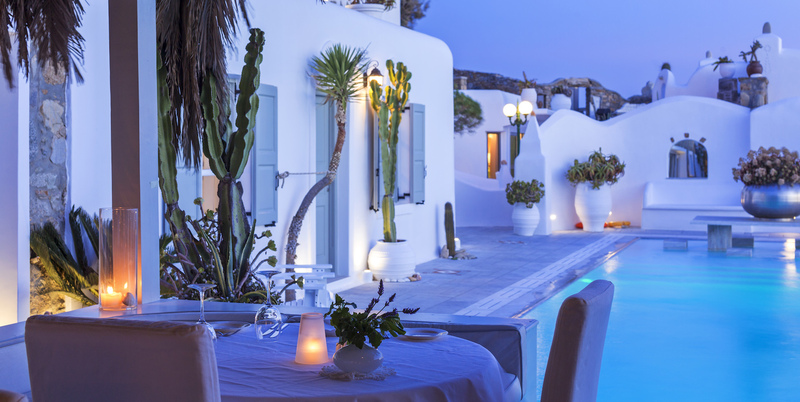 The local taverna is smart and serves excellent good value Greek specialities, whilst meanwhile set on the cliffs above the beach, the Greco Philia Hotel offers luxurious accommodation with sea views. This is a luxury 5* suite hotel that started its life as a family summer home on the cliffs overlooking the bay, about 10 minutes walk from the beach. 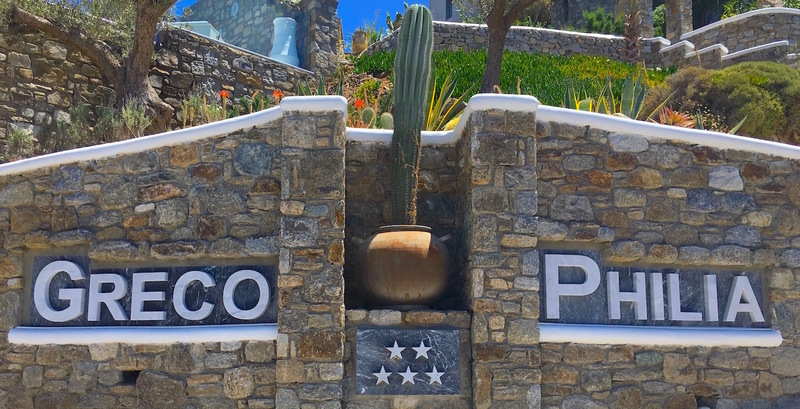 Opened as a hotel in 2007 with just seven suites, it has carefully and gradually expanded over the hillside, via a delightful maze of winding alleyways and stone steps, to a current level of thirty suites and villas, plus spa. The central pool area enjoys the spectacular south-facing views over the bay and is also home to a shady restaurant. The sunsets are to die for, and there surely can be few better ways of ending the day than with a sundowner in hand at the hotel’s pretty poolside cocktail bar. Each Greco Philia Hotel accommodation is unique. 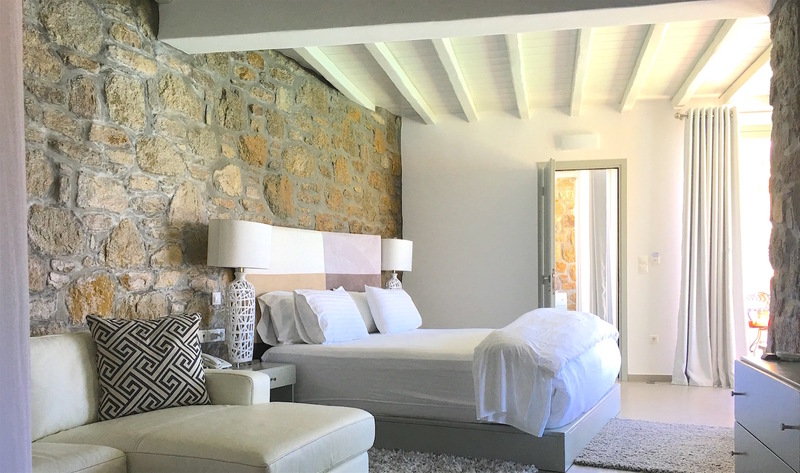 We climbed spiral stone steps to our circular, domed and air-conditioned bedroom with its traditional stone walls. 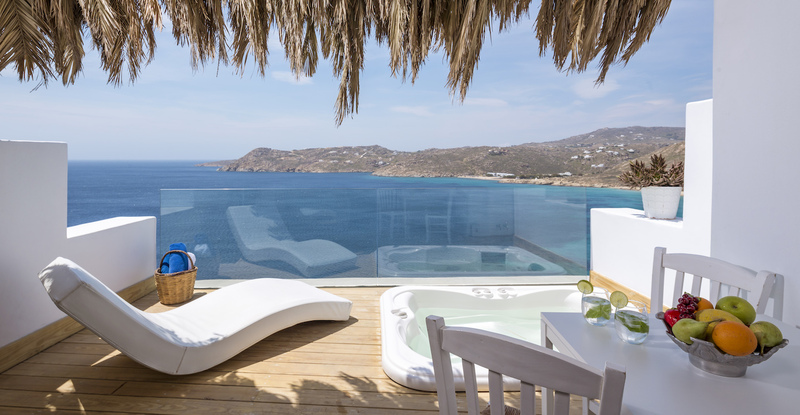 A small seating area lead out to a balcony shaded with a palm frond thatch and stunning views over Elias bay. 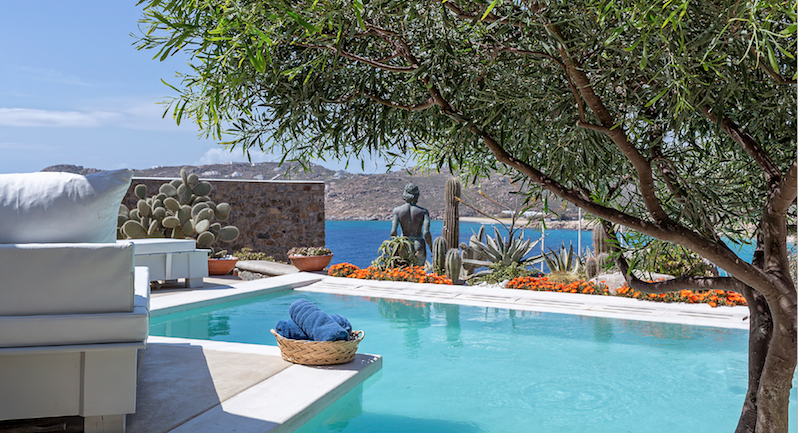 Other suites and villas have varied layouts and may sleep up to six with private jacuzzis or swimming pools. All are beautifully appointed with hypo-allergenic mattresses and pillows, flat screen TV, free Wi-Fi. There are nice unexpected extras like a twice daily turn down service, warm cake and fresh fruits on arrival plus late check out and early check in. Breakfast is served at your table at the pool-side restaurant and lie-ins are no problem; it is served right up until noon. 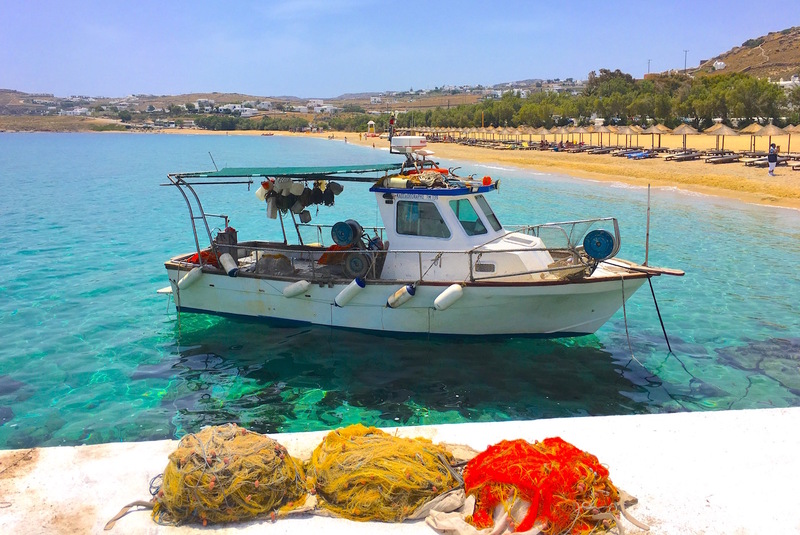 Lunch and dinner is ‘Greek fare with modern flair’, the fresh local seafood and organic vegetables, often from the hotels own gardens – we loved to dine here taking in the amazing sea views. The service here matched the impeccable quality of the hotel and was always at hand and ever-friendly. 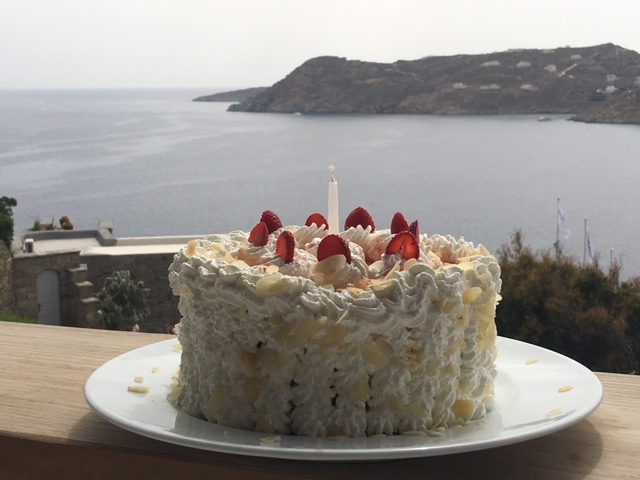 Our Editor celebrated a birthday during the stay, and the busy chef even made time to make a glorious homemade birthday cake. The Greco Philia Hotel is a really a very special place. We were truly sad to leave this wonderful spot and hope to return very soon.